You are here: Home / Join Our Caring Community! If you like working with people and are interested in making a real difference to their day-to-day lives, a career in care could be for you. Whether it’s helping people to stay physically active, or supporting them with their personal care, a Care Worker’s role is to help improve the quality of life of people in need of social care services. What skills or qualifications are needed? Positions are available at a variety of different levels. It’s possible to become a Care Worker with very few qualifications. be a strong and reliable team player. Care Workers are also supported to study for professional qualifications, enabling them to set their sights on higher-level positions within the sector. 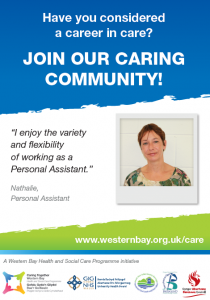 Social Care Personal Assistants (commonly known as PAs) are employed by people who receive Direct Payments to enable them to live as independently as possible. Direct Payments are cash payments given by the Council so people can arrange and pay for their own care and support. People often use the payments to directly employ a PA to help with daily living tasks, taking part in social activities and personal care.